When you’re setting brand objectives, you of course have to clearly identify what the objective is. But it’s even more important to identify the WHY – why it’s important to achieve. A client once told me that her objective for a new brand strategy was to make her business seem “edgier.” When asked why, she told us that she was concerned that her legacy consumer was aging. So she thought an “edgier” presentation would help her attract younger consumers. For over two decades, her brand had delivered prestige, polish and refinement. It was truly a best-in-class service experience with the awards and accolades to show for it. Through the course of the brand strategy project, I was able to convince her that “edginess” was inauthentic. And it would undermine years of brand equity. A better approach to attract new consumers? Adopt new targeting methods and messaging. It worked. Why Are You Chasing Market Share? Some companies reflexively chase market share, which suggests that “bigness” is the only measure that matters. It’s not, especially if you’re a challenger brand, or targeting a high-value niche. In my brand management career, I scored big wins with challenger brands by focusing on sales rate instead of share. We worked to be the best, not the biggest. If you’re an agency staffer or consultant, never take the client’s stated objectives at face value. For instance, the client may say that short-term sales lift is the primary project objective. That may be because that individual is compensated accordingly. Or the company’s investors are preparing it for sale. Or something else entirely. But knowing the “why” behind the “what” can only make you a better decision-maker and a stronger partner. 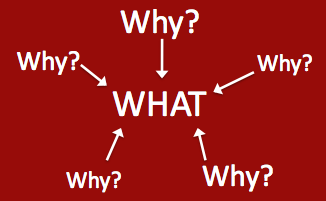 Repeatedly asking “why?” during the objective-setting process forces you to think deeply about what’s really important. The most important objectives will have the strongest “whys” behind them. And hierarchy matters because you’re better off with a few clear objectives than several competing ones. So, when setting brand objectives, ask not only “what,” but “why.” And keep asking “why” until your objectives have an airtight rationale. About Matthew Fenton: Matthew helps challenger brands to focus, grow and win. Since founding his consultancy, Three Deuce Branding, in 1997, he’s helped hundreds of brands to achieve “brand clarity.” His consulting services and speaking engagements help brands to focus on what matters through positioning, strategy and ideation. Contact Matthew here. He calls Chicago home. Copyright 2014 – Matthew Fenton. All Rights Reserved. You may reprint this article with the original, unedited text intact, including the About Matthew Fenton section. "That Branding Thing" is our periodic newsletter. It's designed to bring you the "20" that gives you the "80" in matters of branding, strategy and positioning. At sign-up, you'll receive a free download of "The Challenger's Manifesto" - an 18-page eBook with 10 principles to help you build your brand, plus exercises. After that, you'll hear from us every few weeks with fresh content to help you grow your brand and business. Hood advice Matthew. I have often have clients who state their objectives but have a hard time explaining why they have chosen that particular marketing or website objective. Many times clients see a tactic work for another company and think by mimicking it they can get similar results, but as you point out companies should “true to themselves” and consistent with their branding. I agree with your take, Rob: “What got them to where they are may not get you to where you want to be.” As partners to our clients, we can help them help themselves by seeking deeper understanding. Thanks for your comment!